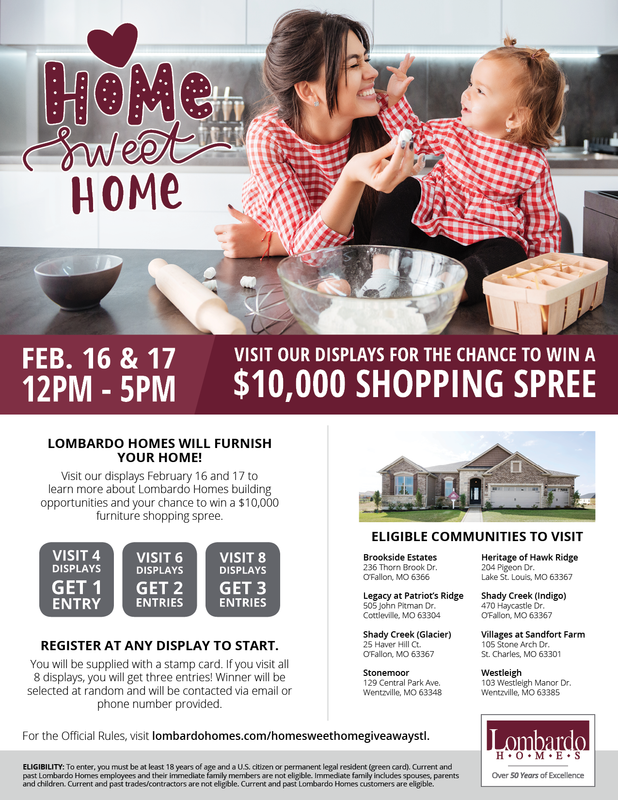 Win $10,000 Shopping Spree from Lombardo Homes! NO PURCHASE OR PAYMENT NECESSARY TO WIN. A PURCHASE WILL NOT IMPROVE YOUR CHANCES OF WINNING. Eligibility: To enter, you must be at least 18 years of age and a U.S. citizen or permanent legal resident (green card). Current and past Lombardo Homes employees, managers, members and their immediate family members are not eligible. Immediate family includes spouses, parents and children. Current and past trades/contractors are not eligible. Current and past Lombardo Homes customers are eligible. You do not have to be a Lombardo Homes customer to participate. To participate in the Home Sweet Home Furniture Shopping Spree, a participant must register at one of the Lombardo Homes eligible displays – Westleigh, Stonemoor, Legacy at Patriot’s Ridge, Brookside, Hawk Ridge, Shady Creek (Indigo), Shady Creek (Glacier), or The Villages at Sandfort Farm – to start on the weekend of the Home Sweet Home Furniture Shopping Spree, which is Saturday, February 16th from 12-5 pm and Sunday, February 17th from 12-5pm. Addresses for the home displays are listed below the rules. Once registered, you will be supplied with a stamp card. If you visit four (4) displays, you will receive one (1) entry. If you visit six (6) displays, you will receive two (2) entries. If you visit all eight (8) displays, you will receive three (3) entries. To register without participating in the Home Sweet Home Furniture Shopping Spree, a participant can request registration without visiting a Lombardo display home by mailing a legibly handwritten, self-addressed, stamped envelope with sufficient postage and a return address, including first and last name, street address, city, state, and ZIP code, along with registrant’s e mail address and registrant’s telephone number, to: Lombardo Homes, 2299 Technology Drive, O’Fallon, MO 63368. A participant may not submit more than three (3) mail entries and each entry must be separately submitted and comply with the requirements for a mail-in entry, including submission in separate envelopes. One entry will be issued with confirmation of entry mailed in response to each mail-in request that complies with the requirements of the Official Rules. Mail-in requests, including both outer envelope and the self-addressed, stamped envelope, must be handwritten. Outer envelope must include a return address in the upper left hand corner that matches the requestor’s street address, and must be postmarked no sooner than February 4th, 2019 and no later than February 17th, 2019, and received by Lombardo Homes at the address set forth above no later than February 18th, 2019. If applicable state law of the state within which the party requesting an entry by mail does not permit the requirement of providing return postage, then the registrant may omit return postage, provided, the registrant may be required to provide proof of residency in such state to Lombardo’s reasonable satisfaction before requests are fulfilled. Each request must be mailed in a separate stamped outer mailing envelope. Requests that are sent in business reply envelopes, that utilize address labels or stickers (for any address), that are photocopied, hand-stamped, computer-generated or otherwise mechanically or digitally produced or reproduced, that are not mailed in separate outer stamped mailing envelopes, or that otherwise fail to comply with the Official Rules, will NOT be honored, acknowledged or returned, and the persons submitting such requests will forfeit any corresponding postage and unused envelopes. Prize Details: One winner will be randomly selected to receive (1) $10,000 gift card to the furniture retailer of their choosing. Drawing and Notification: One winner will be randomly selected from the entries on Wednesday, February 20th, 2019. All entries have the same chance of winning. The winner has not been identified. We don’t know who the winner is. The selected winner will be contacted on Wednesday, February 20th, 2019 via email or phone. The selected winner must confirm via email or phone their acceptance of the (1) $10,000 gift card. If the selected winner does not respond by Thursday, February 21st at 5 p.m. CST, a new winner will be selected at random. Winner Releases: All participants entering this Sweepstakes, and winner by acceptance of prize, agree to waive and release Lombardo Homes from liability, claims or actions of any kind whatsoever for injuries, damages or losses to persons and property that may arise as a result of participation in the Home Sweet Home Furniture Shopping Spree, including travel to and/or from any prize-related activity. Lombardo Homes reserves the right to disqualify users and their entries, without notice, and for any reason.